This map shows the locations and times (the number of seconds after the 5:04 EDT launch) that an Orbital ATK Antares rocket launch will be visible along the East Coast on May 20, 2018. An Orbital ATK Antares rocket will launch a commercial Cygnus cargo spacecraft to the International Space Station from Virginia's Eastern Shore before dawn on Monday, and the launch could be visible to potentially millions of spectators along the U.S. East Coast. The Antares rocket is scheduled to launch at 4:39 a.m. EDT (0839 GMT) on Monday (May 21) and should be highly visible across the East Coast of the United States, weather permitting. 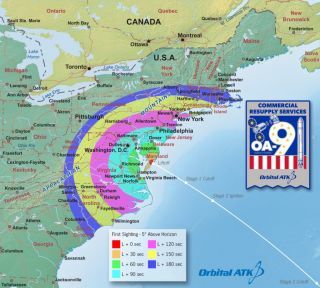 The mission, called OA-9, will launch from the Mid-Atlantic Regional Spaceport at NASA's Wallops Flight Facility in Virginia to deliver more than 3 tons of supplies to the space station. Spectators from Massachusetts all the way down to South Carolina, and almost as far west as Pittsburgh, will have the opportunity glimpse the launch. For those local to Virginia, note that Assateague Island National Seashore/Chincoteague National Wildlife Refuge, a popular launch-viewing site, will not be open. However, for those close enough to visit the launch site, NASA has provided guidance here on how to watch the launch from the Wallops Visitor Center. An Orbital ATK Antares rocket, seen here in a file photo on its launchpad at NASA's Wallops Flight Facility on Wallops Island, Virginia, will launch before dawn on May 20, 2018. It may be visible to spectators along the U.S. East Coast. NASA issued a "three-days-out launch-range forecast" Thursday for the launch with thick clouds at launch time posing the biggest concern. If Orbital ATK is unable to launch Antares Monday, there are back up dates as late as May 25, NASA spokesperson Keith Kohler of Wallops told Space.com in an email. The Cygnus spacecraft is packed with 7,385 lbs. (3350 kilograms) of scientific equipment and experiments, clothing, food, and additional supplies to the Expedition 55 crew aboard the space station. Those experiments range from cold-atom investigations that will push our knowledge of quantum physics to experiments with old-fashioned sextants. That project will evaluate if the traditional, metal tool could be useful for navigation aboard future crewed missions in space. This will be the Orbital ATK's ninth contracted cargo-resupply mission to the space station for NASA. Editor's note: If you spot Orbital ATK's Antares launch in the predawn sky and would like to share a photo or video with Space.com, send images and comments in to spacephotos@space.com. This story was updated to include Orbital ATK's announcement of a launch delay.